Why Are You Showing Us Turds? Anyway, since I did spend several hours coming up with this nonsense I figure I may as well release it in some form or another just so the time spent wasn’t totally in vain. If I have to live with the horror of knowing I wrote this than you should too. So let this be a lesson to you all about just how unoriginal I actually am, and let it also be a lesson to anyone aspiring to write for WotC as to what type of stuff they aren’t looking for in DDI submissions. Let it also serve as a testament as to how out of the loop I currently am with 4e D&D. This was supposed to be a monster template ala Dark Sun Creature Catalog. Enjoy! Or…y’know…don’t, because this stuff is pretty bad. Oh and also, if for some reason you want to see more or hear more about my experiences with this just say so in the comments and I’ll probably publish the other 3 plant-creature monster templates in all of their terrible glory. Most treants and other sentient plant-life call the feywild home, or at least the place of their origin, this is not the case for dreadgnarls. Dreadgnarls actually originated from within the demiplane of dread, a place where the land itself infuses a malevolent sentience into all living things, right down to the very motes of the earth. 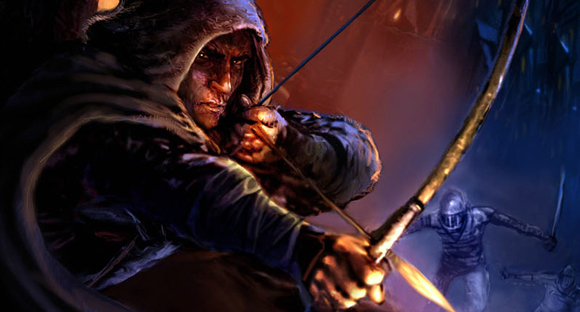 The first dreadgnarls came from just outside the village of Barovia within the Svalich Woods. A forest often traveled by the Vistani people, these woods served as a temporary home to many Vistani who camped within the its ample clearings. Vistani are nomadic and mysterious people said to be without boundaries of realms or the planes, and so they were responsible for bringing the first dreadgnarl seedlings to the Muckroot Trade Moot in the Murkendraw of the feywild, and then into the rest natural world. Dreadgnarl treants appear as common looking trees often found around swampy areas, but can also appear most anywhere else trees thrive. Once night falls however, their malevolence begins to manifest as their bark shifts to an ashen gray-black color. Their trunks both absorb and reflect moonlight which serves to fuel their darkened abilities and play tricks on the eyes. Their fog drooling mouths are formed of split bark that form rows of jagged “teeth” and emit a perpetual baritone hum while agape. 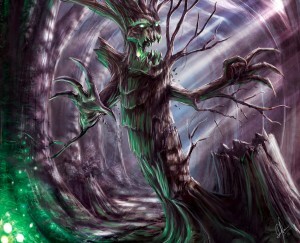 The roots and branches of a dreadgnarl do not form arms and legs as most treants, but function more as earthy tentacles. Unlike others, dreadgnarl treants are capable of stalking their prey through preternatural means. On nights when the moon is its fullest, they are known to mysteriously move entire swamps and forests from one location to another, causing the land to play tricks on even the most seasoned explorers. Skill Modification: +2 bonus to athletics or stealth checks. Haunting in appearance and ruthless in combat, dreadgnarl will stop at nothing to have their adversaries join the ranks of corpses that rest beneath their roots.. Twisting, snapping, undulating roots carry them swiftly to their prey, all the while casting a macabre silhouette against the backdrop of night sky. The deep rumble of theirv voices can be heard for miles, some people call this noise the trumpet of death and refuse to venture out of their homes on evenings when it can be heard. These treants have preternatural strength and the ability to twist and re-shape their branches to constrict their foes with a deadly grip. [titled_box title=”Strangulate * At-Will” variation=”green”]Trigger: This creature makes a basic melee attack against a target within its reach. Animals don’t often congregate around dreadgnarls aside from the occasional flock of bats or other nocturnal creatures. Some of these creatures make permanent dwellings inside dreadgnarls and form a close bond, lashing out at those who threaten their home. Hit: damage equal to this creature’s basic attack and the target takes an ongoing 5 damage per tier. 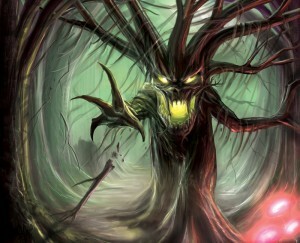 A stream of choking fog billows forth from the crooked maw of the treant as it taunts its enemies with a hallowed voice. While many of the dreadgnarls have no need for abilities beyond subterfuge and raw power, they do have a variety of other useful and grim manifestations from the demiplane of dread at their disposal. Drawing from the spirits of fallen souls deep beneath the soil, dreadgnarls can spawn unnatural life from the very ground they tread upon. There is still a wreath of dark power from the demiplane of dread that surrounds dreadgnarl creatures. This halo of evil fills mortal creatures with unexplainable fear, depravity, and flickering visions of the stark landscapes of Barovia. Otherworldly strength granted by dark powers allows dreadgnarls to wring the life out of their foes. Writing is hard, no doubt! I’m not sure whether you are looking for feedback. My quick guess is that they found too many cases where the submission is out-of-line with their normal approach. The powers don’t use the same language that published powers do. That’s a tough thing to do. My approach is to always find a minimum of 2 powers that are similar to what I am creating and to very carefully emulate that language. Searching for keywords such as “grab” can help locate those powers for comparison. There is tremendous discipline with writing monsters or monster themes. If enough parts deviate from the norm, the work for the editor is too high and the article will get rejected (been there!). The other part is how the whole works together. The various mechanical bits should really feel like a cohesive whole. Each part should fit together to reflect the story/lore for the article. If the creature is a swamp snake, poison fits right in, but ongoing fire or the ability to create an illusory duplicate likely won’t without retooling. The story itself has to really work well. That’s something the Dark Sun monster themes do pretty well – there is a strong thematic story and each monster theme power is tied closely to that. It can’t be said enough how important playtesting or making several editorial passes is to the process of writing. For monster themes, I would want to look at 2-3 monsters and see how they look with that theme applied, the way they did in DMG2. If this is my first time approaching a subject (such as monsters or monster themes) I typically ask one of my mentors or peers if they mind reviewing it. Similarly, I’ve had them ask me to review content. It speaks to how hard it is to know, in our brains, that we really created quality. This is a great community and I’ve found such review to be really helpful. I do really hope you try again. There is something really fantastic about freelancers doing the work to create content that can benefit so many people. I certainly wouldn’t call it a “turd” per se, but it could have benefited from a good dose of editing (as you said). In particular, there’s the “Bleak Presence” power, which appears to be a rewritten “Reanimate” block. Having said that, the creature itself is interesting, and I may look to bring it in to my home game down the line. I vote for showing us your other creations too! Haha, wow. I just noticed that and thought I was a mis step I made when porting it over to the blog – nope! That’s exactly how I submitted this. 🙁 I was going to edit it, but I may as well leave it up as a standing ovation toward just how bad this was. Haha! It’s rough, and of the standard i’d probably post on a blog. The lack of editting shows in the lore and wording of the powers, and the fact the powers don’t feel like a totally coherent theme. On the flipside, I liked it, there’s certainly ideas there that I’d use. What possibly went against you in the submission was that it was Shadowfell based and thus not the current ‘in’ thing when the submission window was open. Yeah it doesn’t feel coherent at all. I was trying to do a monster “theme” so that you could pick any number of these and plug them into other creatures. I was told to stay away from just focusing on treants and expand to general plan-creature adaptability and I think that hurt me. I had some solid ideas for treants but wasn’t resourceful/creative enough to really make them stretch onto other creatures and the whole process just mad the whole weaker as a result I think. This was actually supposed to be a feywild article, the other submissions are a little more fey, but this one was certainly my own one track mind being predisposed to writing horror-esque stuff. Thanks for the feedback Adam, I appreciate it. Yours and everyone else’s too.